Today, BMW announced updates to the second generation of the successful BMW ALPINA B7 super-high performance luxury sedan with more performance, fresh design features, and improved efficiency. The new B7 is slated for a North American debut at the historic Pebble Beach Concours d’Elegance in August and will go on-sale immediately thereafter. Pricing will be $127,600 (B7 Standard Wheelbase), $130,600 (B7 SWB with xDrive), $131,500 (B7 Long Wheelbase), and $134,500 (B7 LWB with xDrive). 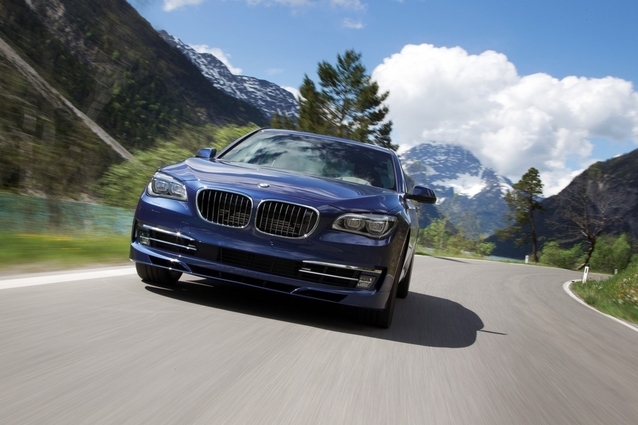 The new BMW ALPINA B7 has been enhanced in-line with updates to the 2013 BMW 7 Series Sedans including more power, more performance, and more efficiency. The new B7 features 40 additional horsepower (now rated 540 hp) and 22 lb-ft more torque (up to 538 from 516 lb-ft) thanks to the addition of BMW’s Valvetronic throttle-less intake technology and a new ALPINA 8- speed high performance transmission. Top speed is now a fierce 194 mph (drag-limited, 193 mph with xDrive), up from the previous 175 mph. Acceleration drops into the low-mid-4-second range for all variants (4.3-4.4 seconds). The BMW ALPINA B7 Sedan remains the benchmark in terms of luxurious performance, chassis technology, and hand-finished exclusivity.